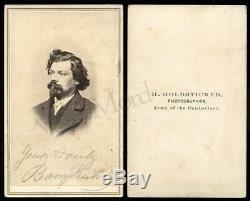 CDV of a dashing man, signed in pencil below his photo. On the back is a photographer's identification. The item "1860s Antique CDV Photo by Goldsticker ARMY OF CUMBERLAND Civil War Soldier" is in sale since Thursday, January 10, 2019. This item is in the category "Collectibles\Photographic Images\Vintage & Antique (Pre-1940)\CDVs".